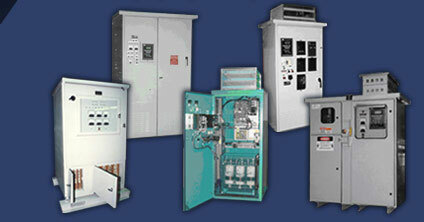 Engineering Power Conversion Solutions - Kinetics Industries, Inc. Welcome to Kinetics Industries, Inc.
Kinetics Industries, established in 1939, is an integrated manufacturer of highly reliable and durable SCR regulated and diode line-regulated power rectifiers, industrial DC power supplies, fuseless bolted fault rated magnet rectifiers, flux forcing magnet rectifiers, crane rectifiers, DC substations, synchronous motor field & generator excitation systems and power conversion solutions. Kinetics’, world diverse, engineering and technical staff designs and manufactures industrial, commercial, utility and military application power conversions products to the highest quality of domestic and international standards. Kinetics’ design and manufacturing capacity includes; dry type transformers, enclosure and panel fabrication, digital & analog electronic circuitry and power semi-conductor assemblies.